یگانه, مهدی, محمدی, نیلوفر, مرعشی, سیدمهدی. (1397). ایجاد سطح فوق‌آبگریز بر روی آلیاژ منیزیم AZ31 به کمک غوطه‌وری شیمیایی و بررسی مقاومت به خوردگی آن. نشریه علوم و مهندسی سطح, 14(35), 81-87. مهدی یگانه; نیلوفر محمدی; سیدمهدی مرعشی. "ایجاد سطح فوق‌آبگریز بر روی آلیاژ منیزیم AZ31 به کمک غوطه‌وری شیمیایی و بررسی مقاومت به خوردگی آن". 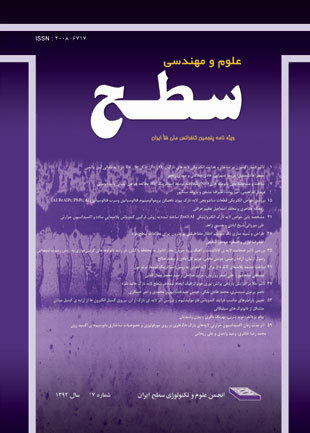 نشریه علوم و مهندسی سطح, 14, 35, 1397, 81-87. یگانه, مهدی, محمدی, نیلوفر, مرعشی, سیدمهدی. (1397). 'ایجاد سطح فوق‌آبگریز بر روی آلیاژ منیزیم AZ31 به کمک غوطه‌وری شیمیایی و بررسی مقاومت به خوردگی آن', نشریه علوم و مهندسی سطح, 14(35), pp. 81-87. یگانه, مهدی, محمدی, نیلوفر, مرعشی, سیدمهدی. ایجاد سطح فوق‌آبگریز بر روی آلیاژ منیزیم AZ31 به کمک غوطه‌وری شیمیایی و بررسی مقاومت به خوردگی آن. نشریه علوم و مهندسی سطح, 1397; 14(35): 81-87. با توجه به کاربردهای وسیع آلیاژهای منیزیم در صنایع گوناگون، خواص ضعیف سطحی آنها مانند مقاومت به اکسیداسیون و خوردگی همواره بعنوان یک چالش مهم در تجاری سازی این آلیاژها مطرح بوده است. ایجاد سطوح فوق‌آبگریز روشی کارآمد و موثر جهت بهبود مقاومت به خوردگی ضعیف آلیاژهای منیزیم بوده که در سال‌های اخیر بیش از پیش مورد توجه قرار گرفته است. در این تحقیق، ایجاد ساختار فوق‌آبگریز (SHPs) به روی آلیاژ AZ31 منیزیم به کمک غوطه‌وری درون محلول CuCl2 و NiSO4 و سپس غوطه‌وری در محلول استئاریک اسید (SA) مورد بررسی قرار‌ گرفته‌است. زاویه تماس آب با سطح به دست آمده ° 5/151 اندازه‌گیری شده‌است. طیف‌سنجی تبدیل فوریه مادون قرمز (FTIR) حضور پیوند‌های مربوط به استئاریک‌اسید را روی سطح ارایه داد. همچنین تصاویر میکروسکوپ الکترونی روبشی گسیل میدانی(FESEM) وجود یک ساختار پولک مانند را که موجب جلوگیری از نفود الکترولیت به زیرلایه منیزیم شده بود را نشان‌ داد. نتایج آزمون طیف‌سنجی امپدانس الکتروشیمیایی (EIS) و پلاریزاسیون پتانسیودینامیک مشخص نمود مقاومت به خوردگی سطح آبگریز حدود 1000 برابر از آلیاژ منیزیم بیشتر است که به دلیل مورفولوژی زبر و مولکول‌های جذب شده بود. 1. A. Atrens, G.-L. Song, M. Liu, Z. Shi, F. Cao, M. S. Dargusch, Review of Recent Developments in the Field of Magnesium Corrosion, Advance Engineering Materials, (2015) 1 54. 2. Z. R. -Chang, Z. Jin, H. W.-Jiu, W. Dietzel, K. U. Kanier, C. Blawert, K.E. Wei, Review of studies on corrosion ofmagnesium alloys, Trans, Nonferrous Met. SOC. China 16 (2006) 763- 771. 3. M. Easton, A. Beer, M. Barnett, C. Davies, G. Dunlop, Y. Durandet, S. Blackket, T. Hilditch, P. Beggs, Magnesium Alloy Applications in Automotive Structures, 60 (2008)57-62. 4. G. Song, A. Atrens, G. Song, A. Atrens, Recent Insights into the Mechanism of Magnesium Corrosion and Research Suggestions, advanced engineering materials 9 (2007) 177-183. 5. R. Udhayan, D.P. Bhatt, On the corrosion behavior of magnesium and its alloys using electrochemical techniques, J. Power Sources 53 (1996) 103–107. 6. Miaomiao Liang, Yinghui Wei, Lifeng Hou, Haiyang Wang, Chunli Guo, Fabrication of a super-hydrophobic surface on a magnesium alloy by a simple method, Journal of Alloys and Compounds, 656(2016) 311-317. 7. Takahiro Ishizaki, Sou Kumagai, Mika Tsunakawa, Takuya Furukawa, Kae Nakamura, Ultrafast Fabrication of Superhydrophobic Surfaces on Engineering Light Metals by Single-Step Immersion Process, Materials Letters, 193(2017) 42-45. 8. Joy Gray-Munro, Justin Campbell, Mimicking the hierarchical surface topography and superhydrophobicity of the lotus leaf on magnesium alloy AZ31, Materials Letters, 189( 2017) 271-274. 9. Shaohua Wang, Xingwu Guo, Yijun Xie, Lihua Liu, Haiyan Yang, Rongyu Zhu, Jia Gong, Liming Peng, Wenjiang Ding, Preparation of superhydrophobic silicafilm on Mg–Nd–Zn–Zr magnesium alloy with enhanced corrosion resistance by combining micro-arc oxidation and sol–gel method, Surface & Coatings Technology 213 (2012) 192–201. 10. A.B.D. Cassie, S. Baxter, Surface roughness and contact angle, Trans. Faraday Soc. 40 (1944) 546–551. 11. Hui Feng, Shuhong Liu, Yong Du, Ting Lei, Tiechui Yuan, Effect of the second phases on corrosion behavior of the Mg-Al-Zn alloys, Journal of Alloys and Compounds, 695, 25 (2017) 2330-2338. 12. S.-Y. Han, D.-H. Lee, Y.-J. Chang, S.-O. Ryu, T.-J. Lee, C.-H. Chang, The Growth Mechanism of Nickel Oxide Thin Films by Room-Temperature Chemical Bath Deposition, Journal of The Electrochemical Society, 153 (2006) 382-386. 13. W.F. Ng, M.H. Wong, F.T. Cheng, Stearic acid coating on magnesium for enhancing corrosion resistance in Hanks' solution, Surf. Coat. Technol. 204 (2010) 1823–1830. 15. M. Yeganeh, M. Saremi, Corrosion inhibition of magnesium using biocompatible Alkyd coatings incorporated by mesoporous silica nanocontainers, Progress in Organic Coatings 79 (2015) 25–30. 16. A. Keyvani, M. Yeganeh, H. Rezaeyan, Application of mesoporous silica nanocontainers as an intelligent host of molybdate corrosion inhibitor embedded in the epoxy coated steel, Progress in Natural Science: Materials International, 27 (2017) 261-267. 17. Zhiguang Guo, Weimin Liu, Bao-Lian Su, Superhydrophobic surfaces: From natural to biomimetic to functional, Journal of Colloid and Interface Science 353 (2011) 335–355.